« Green Smoothie Challenge coming up on April 1st. 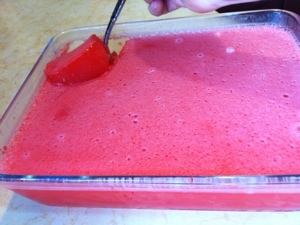 I might try this, but I would like to find a way around using the jello mix. 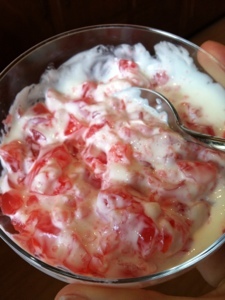 My MIL loves making a ton of Jello for our son, but when she started making it with so much gelatin (she added extra knox blox) that the gelatin was going right through him, I decided no more gelatin. I hadn’t thought of using protein powder! I have Jay Robb’s vanilla egg white protein powder that I should use up. 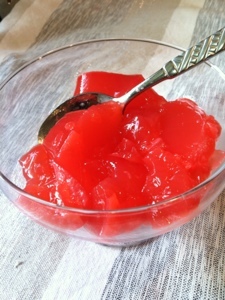 Maybe I could use applesauce and knox blox for the jello substitute and add the protein powder? I think I will and let you know how it turns out. I went home for lunch today and I think I might try some ripe bananas blended with some thawed strawberries and add some applesauce for a bit more liquid. I am thinking the vanilla protein powder will go well with those flavors. I might add a little honey to the mix for a little sweetness. I just hope it doesn’t end up being a mess!